The best thing about tandem bikes is that they are fun. Not only are you riding along with someone that you enjoy spending time with, but you’re also getting a workout and exploring at the same time! The best tandem bike is going to encompass many features that you would look for in a road bike, single speed bike, or even a beach cruiser. The difference, however, is that multiple parts are necessary throughout the bike, in order for the tandem function to operate properly. If you follow the recommendations below, you’re bound to find a solid tandem bike option and be off cruising in no time. There are always a plethora of bike types due to the varying gears, brakes, speeds and styles of bikes. Though tandem bikes all look relatively the same from afar, when you see them up close, you might notice a different style of frame, gear shifter, or even wheel size. 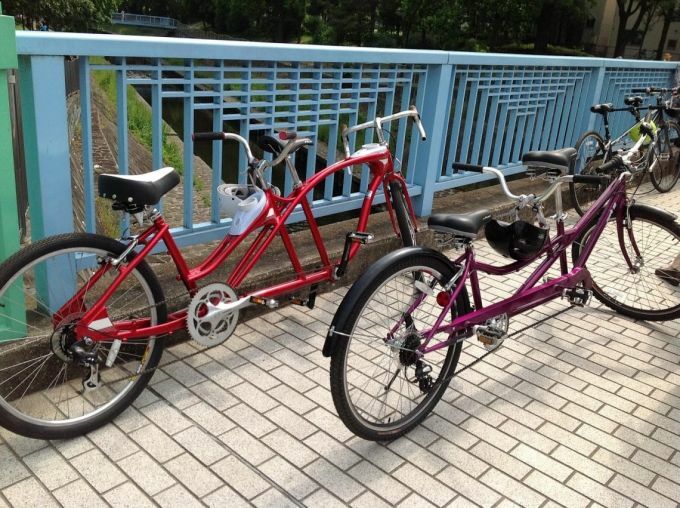 The different types of tandem bikes might sound familiar–go ahead and take a look! These types of tandem bikes typically have freewheel or fixed gear capabilities and a manual, back foot brake. Most single speed tandem bikes mirror a typical single speed bike, yet with dual handlebars and dual pedals/brakes. Most tandem bike wheels are 26”, especially on a single speed bike with a manual brake. These bikes are easy to use and super “cruiser” The single speed tandem bike is great for first-time tandem bikers. Picture an extra-long, thinly-framed road bike with two saddles, two sets of handlebars and two pedal/braking systems; this is what a tandem road bike looks like. Seeing as though your average road bike has unique handlebars for maximizing speed, the tandem of this bike will also encompass the same feature; this might look a bit odd for a tandem, but just remember that it’s efficiently made. The tandem road bike is usually a single speed bike with freewheel or fixed gear capabilities and might take some time to get used to. This type of bike isn’t recommended for first-timers. The mountain bike type of tandem is more rugged than others and has similar features to a traditional mountain bike. This type of bike is typically 21-24 speeds, with rim (pull) or disc brakes, and a thick, durable frame. If you’re looking to hit the trails with a buddy or go the distance with ease, this type of tandem bike might be the best choice. While the road bike is great for commuting and the cruiser bike is great for beach riding, the mountain bike tandem is better for adventures with a friend. This is the perfect type of tandem bike to rent on vacation or if you reside in a quaint beach town. They have cruiser tandem bikes available for kiddos to ride on the back with mom or dad, or even for two adults to enjoy. These tandem bikes also fit into the category of a “comfort” bike that sit a little bit lower than a standard tandem, and have comfortable plush seats with wide set handlebars. Cruiser tandems and single-speed tandem bikes are great for first-time tandem riders. Tandem Bikes come in a variety of sizes and styles but have many similar features in common. Though these features vary from bike to bike, there is a common ground for most tandem bikes and here are some guidelines to help you decide which bike is right for you (and a friend)! Not all tandem bikes are the same. There are some bikes that are made for two adults to enjoy together, some made for children, and some made for one adult and one child. Make sure you research which size bike you should invest in and then use the rest of the “features” guide to narrow down your options. Another thing to keep in mind is the frame size versus the height of the saddle. Seeing as though most saddles on the bikes are adjustable, this shouldn’t be a problem; however, the frame can’t necessarily be adjusted as easily a bike seat. Sometimes the frame doesn’t work well with the rider, therefore, the bike might not be the best fit. Tip: Make sure to check the sizing of the frame and possibly consult a bike engineer or connoisseur before purchasing the new part. Which of the tandem bike styles suits your adventures best? 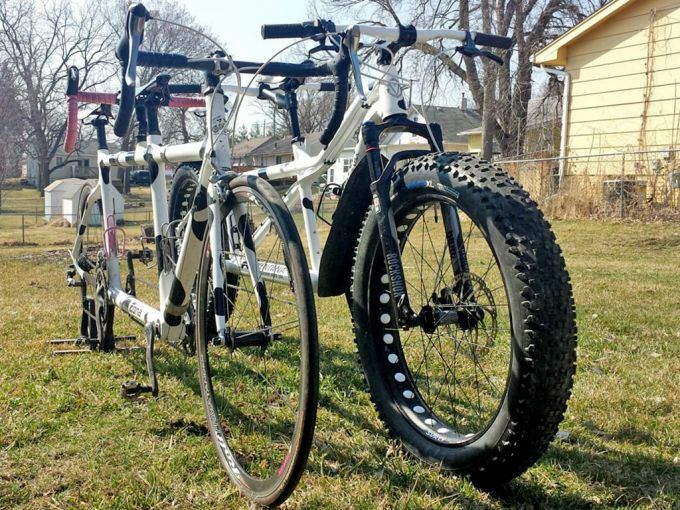 Is it the cruiser, tandem bike or mountain bike? You wouldn’t want to purchase a road bike tandem if that’s not great for your location or comfort level. The neat thing about tandem bicycles is that parts can be removed, replaced or added as you go on to customize the bike to fit your own personal wants and needs. With the help of a local bike shop you’re able to replace the brakes, swap old handlebars out for stylish new ones, and even change the color of the bike, if you’d like. Tandem bicycles are a cool transportation option as is, might as well turn up the style a bit! Tip: Make sure you research what you want to get out of the tandem bike and your experience before making the splurge. Though everyone tries to pretend that this feature isn’t important, it totally is, especially for a type of recreational bike like the tandem. You want to explore with your friends and family but you also want to look stylish while doing so! Make sure that you find a bike that suits your style, comfort and look. An important thing to keep in mind is that if the color that you like isn’t offered for the bike of your choice, you can always change the color! Though it isn’t as easy and grabbing a can of spray paint and changing the color overnight, bikes can be re-painted to your desired color; consult your local bike shop to speak further about this. Tip: Bike manufacturers sometimes choose color schemes for a reason and for a specific look. Make sure you are 100% that you (and your tandem buddy) want to change the color, before doing so. This part of the tandem bicycle is an interesting feature that most don’t think about as in depth as they should. Though most just believe that specific handlebars are on the bike for purely style reasons, that isn’t always the case. There are a few types of handlebars that are pretty common: bullhorn, flat and drop. The bullhorn handlebars fit into the bigger category of drop handlebars, both of which are typically found on racing or road bikes, allowing more control over the bike and taking a more efficient, aerodynamic position on the uphills and downhills. Flat handlebars, on the other hand, are typically set much wider apart that the drop handlebars and are seen most commonly on cruiser or comfort bicycles. These handlebars are beneficial for the cruising style because it sits you more upright on the bike and allows you to be comfortable while riding. Tip: As with other parts on the bike, handlebars can always be swapped out for another kind that suits your style of riding, and/or tandem partner the best. Some don’t always look great in two spots (bullhorn). Now that you have an outline for the type of tandem bike that you’re searching for, it’s time to take a look at some specific bikes. 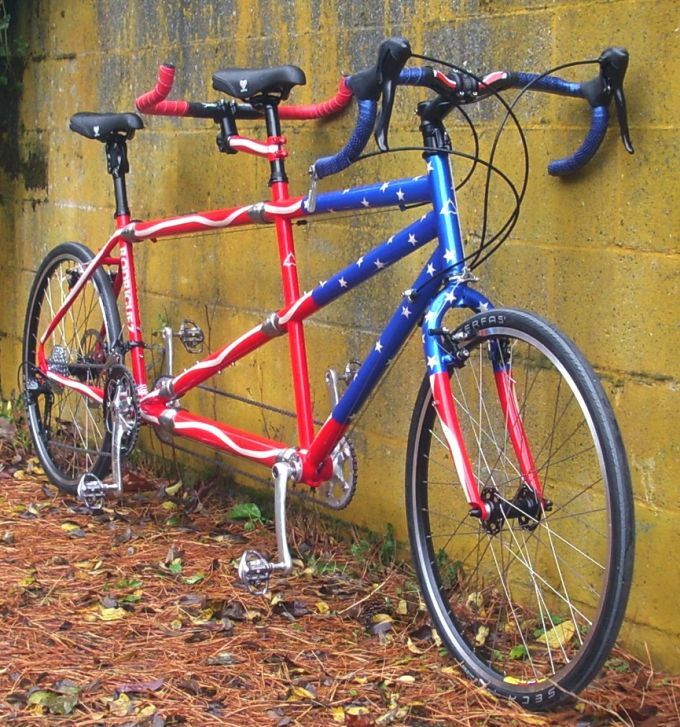 These are sure to lead you in the right direction for your purchase of a tandem bike. Kulana Lua Single Speed Tandem is a great size for two adults, or one adult and one child, looking for some casual cruising. It’s offered in a fun yellow color and comes with an old school, foot-operated brake. The handlebars are pretty standard for a single speed cruiser, accompanied by an oversized front fork on the bike. The saddle of this bike is a cruiser spring seat and the fenders that run parallel to the bike are a great safety feature that allow riders to cruise freely in all weather conditions. This is a great bike for those tandem-ing for the first time. Giordano Viaggio Tandem Road Bike has the make and build of a standard road bike, with tandem features. It has an 8-speed gear shifter, freewheel capabilities and custom-designed aluminum frame. This is the perfect fit for “commuting” to work with a friend or if you’re looking to take on some speed, tandem-style. The bike features alloy pull brakes and 24-speeds. It’s coated in a cool, blue azure color and has stylish, bullhorn handlebars. Not only can you cruise in style on this hip, lightweight road bike, but you can do so with a friend! Pacific Dualie Tandem Bicycle is great for exploring the neighborhood or local trails with buddies. With a mountain bike-style frame, it can pop over some of the more tough terrains and is more durable as a bike in general. This bike boasts the standard, 26” wheels and side pull brakes; the frame is long and thin, proving a lightweight feel to very sturdy bike. It has your standard handlebars, along with black and white paint, proving it to be pretty basic, but definitely great for some of the tougher trails. 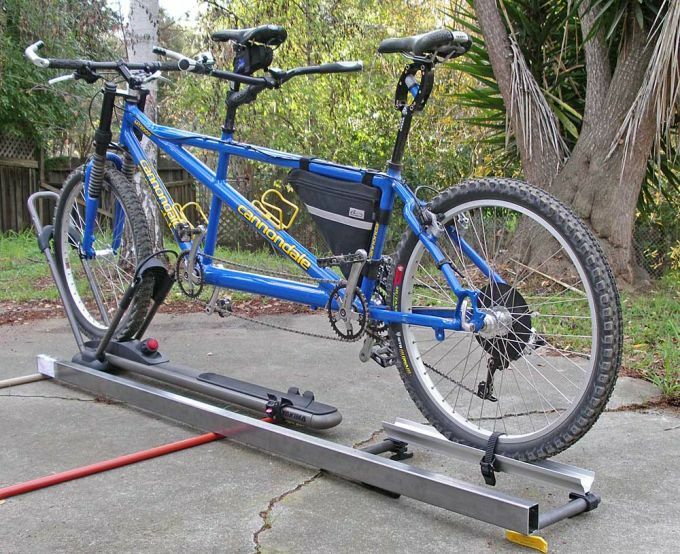 This Pacific dualie is great for taking your tandem-style bicycling to the next level. Kent Northwoods Dual Drive Tandem Bike offers the whole package. Not only does it feature dual drive and pull brakes, but you can ride in comfort with the dual gel saddles and 1.95” extra-wide tires, which are great in sand or against the tougher terrains. This bike is a 21-speed and even offers a water bottle holder for each rider. This cruiser is positioned nice and low, with a standover height of just 29” in the front and 20” in the back, which makes it easy to hop on and off. You can take this cruiser anywhere and ride in style. This bike is recommended for families or friends that are more recreational with their activities; this is a great tandem bicycles for those trying it out for the first time. The 26” Tandem Bike is your very standard, average tandem bicycle. It even comes in a very basic, cruiser color: yellow. This bike features 26” wheels, and oversized fork and the casual, hi-ten frame, which allows the biker to have ultimate comfort during their ride. It is great for beginner riders or for those looking to take a casual ride around the neighborhood or on the beach path. The wheels are stylish and go well with the rest of the bike. One downside to this bike is it’s price. 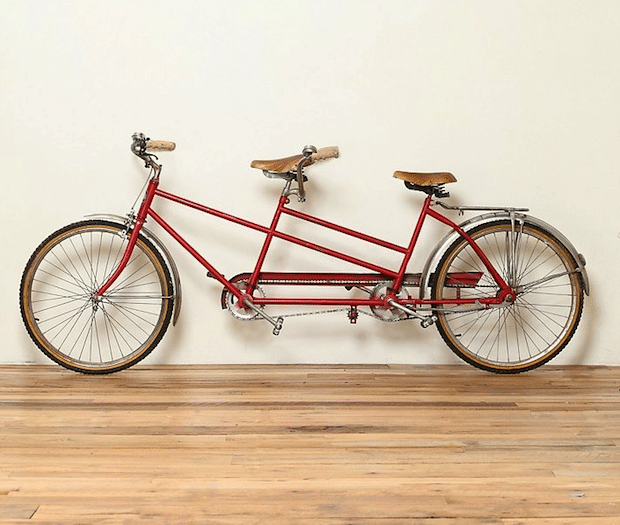 For a very plain, simple tandem bike, this one is definitely over-priced. I would keep looking past this tandem bicycle and try to find one that is better priced and cooler as a whole. Micargi Island Tandem Bicycle is stylish and well-made. It is offered in three colors (blue, black, or red) and has a lightweight, thinner frame that has the looks of a road bike but the size and style of a cruiser. It offers “moon” handlebars and Shimano brakes, featuring a freewheel option and white-walled tires. This road cruiser will keep you and your friend on the go with its hi-ten steel frame and 3-piece crankset. Though it is priced a bit higher than some of the other tandem bikes, this one is worth the money; it is a true to quality product. There are some important pointers to know before you buy a new tandem bike for you and your friend. Due to the varying sizes of the tandem bicycles and their riders, it’s important to follow the sizing charts online or get fitted in-store for the tandem bikes, before you buy. Use these guidelines to find a few bikes that might be in your size and style range, and then make sure the fit is accurate. Similar to clothing, the sizing charts may say one thing, but not be as accurate as deemed. Another insider tip is that you can always add new features or items to your bike as you go. Have you ever purchased a bicycle from a bike shop before? The salesman will typically try to up-sell you on some extra items for the bike, including a bell, a basket or even a water bottle holder. Keep in mind that not only do some of these bikes already have this special item attached, but you may be able to find the part elsewhere, for a better price. But hey, it’s nice to know that the option is there and that you can always spice up your new ride if you want to! Now that you have some choices, it’s time to grab a friend, get out there and take a ride! Though there are a variety of specific types of tandem bicycles, they all serve the same purpose: to ride with a buddy on the back. Whether you’re looking to hit the tougher terrains, bike around town or cruise along the beach path, any of these tandems could get the job done. Sure, some offer a more laid back style than others, and certainly some are more reasonably priced, but for the most part, any one of these tandem bikes will do. An important tip to remember is the size of the bike. 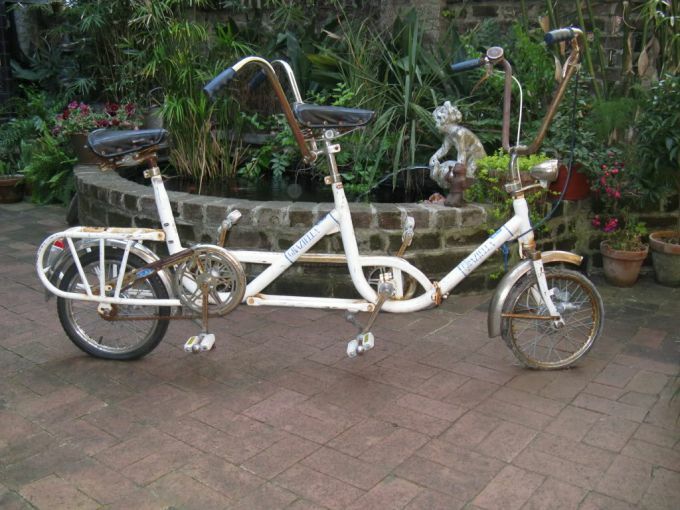 Keep in mind that the size of your tandem bike will be determined by the buddy that you’d like to stick on the back. There are some tandem bicycles with adjustable handlebars and seats, and others that are more fixed in their position. Be prepared to do a little bit more research and keep this recommendation list handy! If you’ve already ridden any of these cycles, give us a shout in the comments section– we’d love to hear from you! Feel free to browse other comments, leave a review or keep this article as a reference.